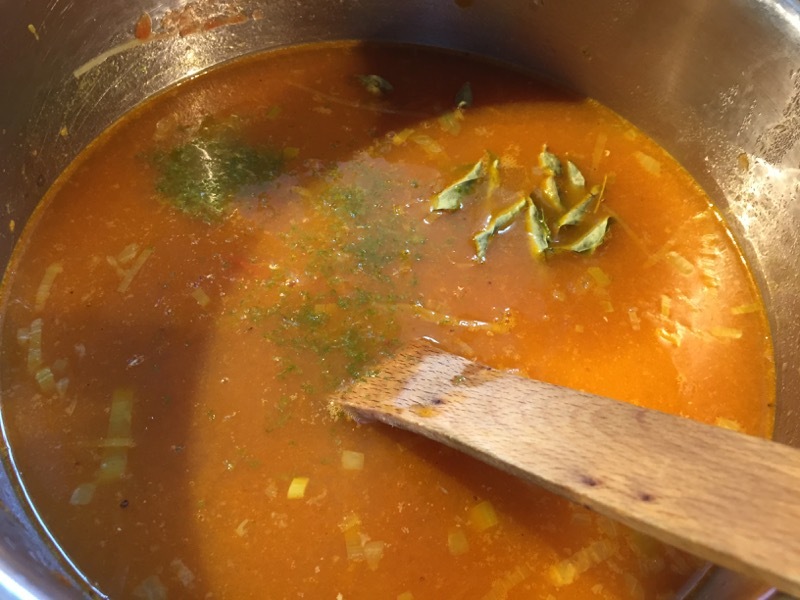 When I was a kid, one of my very favourite soups was Heinz Mulligatawny Soup. It wasn’t subtle, it was a no-holds-barred sort of soup. Strong, spicy and curried. I loved it. It seems my penchant for spice and flavour started at a pretty young age. 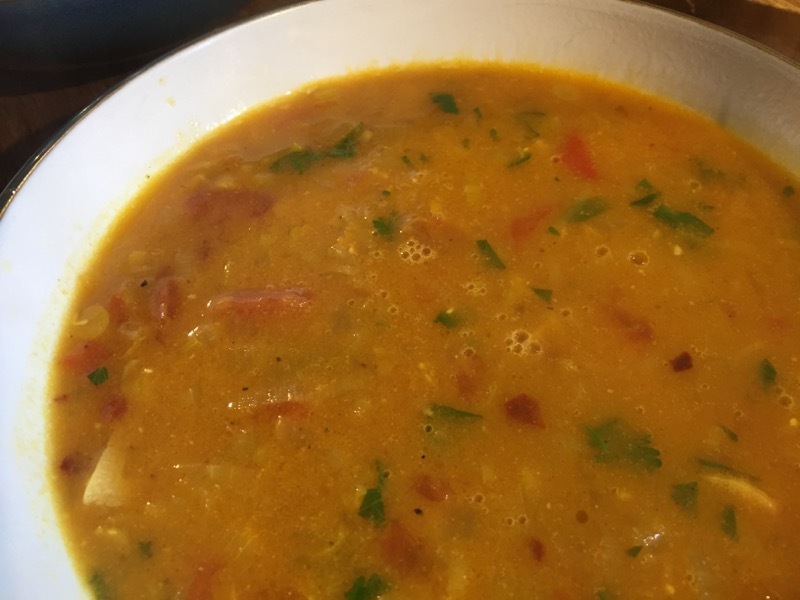 I still eat it today from time to time, but these days I’m under no illusion about it – it is, I’m sure, absolutely nothing like a true authentic Mulligatawny. Now, the authors say that the recipe in The Prawn Cocktail Years might be considered “wildly inauthentic”, but I bet it’s a darn sight closer than those tins of flavour bombs from Heinz. I’ve made this recipe many times before, so I’m pretty confident that this is going to make a great Saturday lunch. I have fresh chicken stock, made last night from the remnants of last week’s roast chicken. I’m good to go. 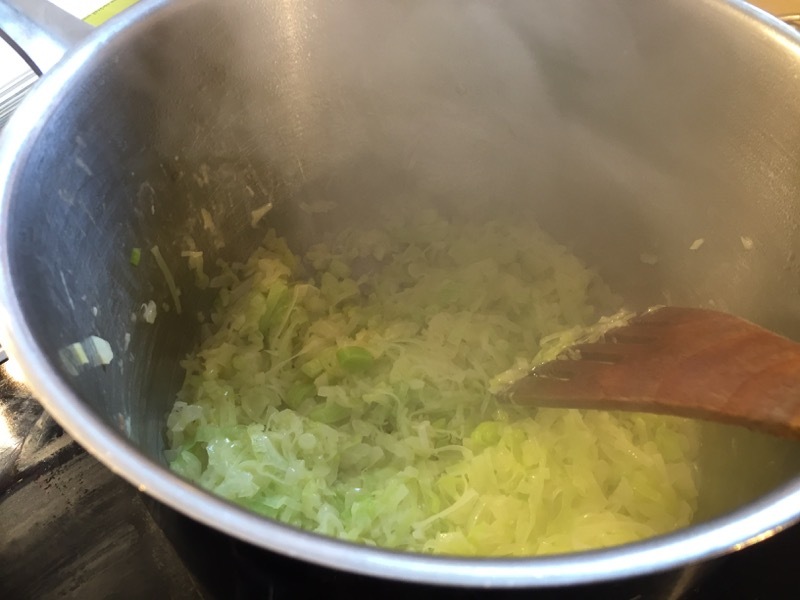 I chop onions, and slice leeks, then cook them in butter until pale golden. Next, the spices: turmeric, cumin and garam masala (home-made, of course), and it cooks for a few minutes more. I add a tin of chopped tomatoes and cook for another few minutes. And then, the chicken stock, some lentils, curry leaves, cardamoms and lime zest. I give it a good stir and let it simmer for a while, skimming off the scum that rises as I go. 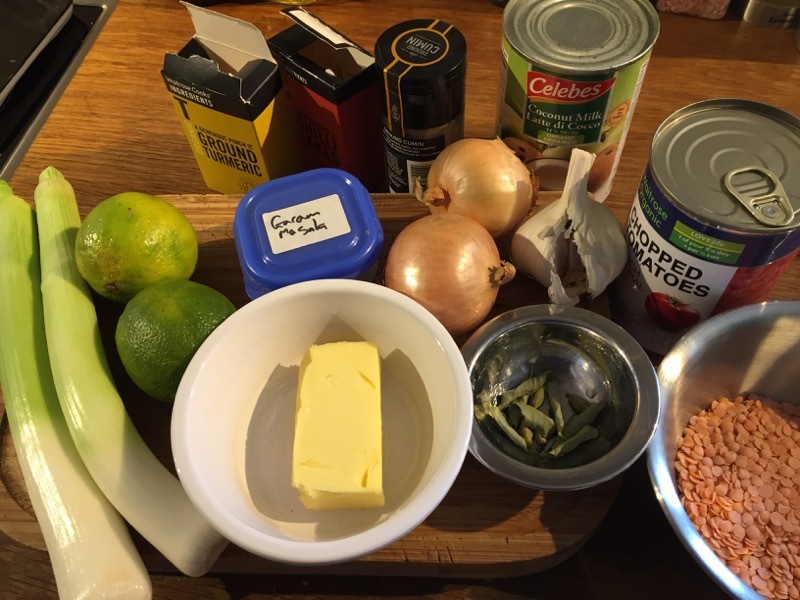 Once the lentils are soft, I add chilli flakes, coconut milk, and some lime juice. Well, I try to add some lime juice. As I squeeze the lime, it catapults out of my hand straight into the pan. There is now soup all over the cooker top and down my front. My copy of the book was open, next to the stove, and I can say that the recipes for Potted Shrimps and Cauliflower Cheese will never be quite the same colour again. So, I eventually manage to fish the lime out of the soup – it’s very evasive and makes multiple bids for freedom. I clean it off and squeeze it properly into the soup. 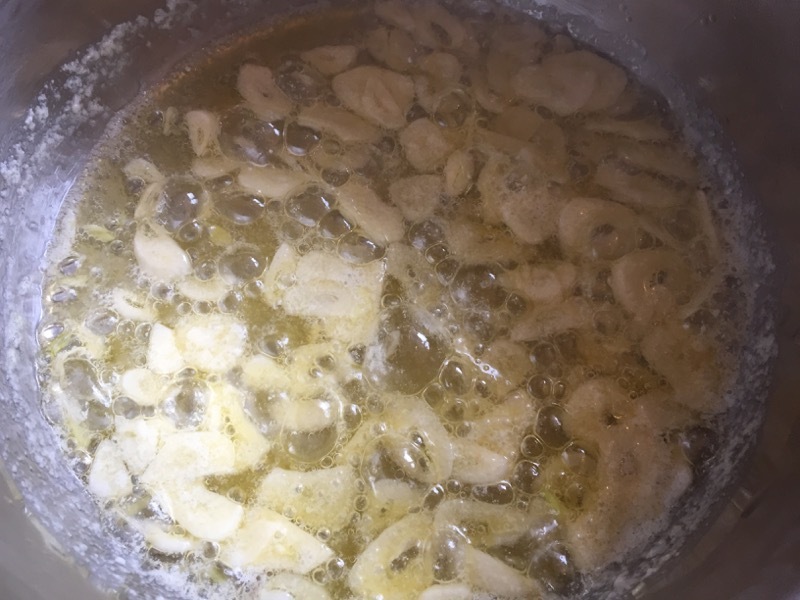 While the soup simmers for a little longer, I slice up some garlic and cook it gently in butter until golden. 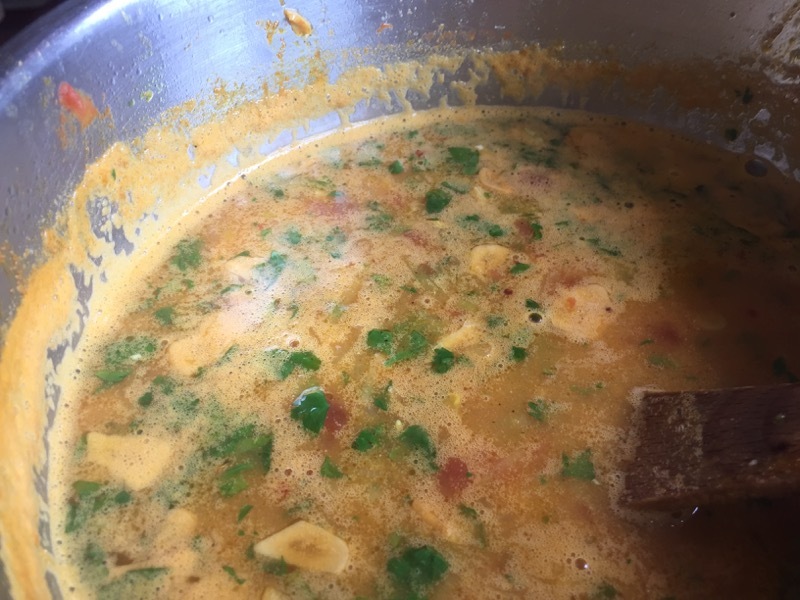 I then add the garlic, the butter and some chopped coriander to the soup. Well, as I said at the start, I’ve made this before, many times. It’s always been delicious before and this occasion was no exception. The real secret is starting out with a good, flavourful stock. Once you have that, it’s hard to go too far wrong. This soup is absolutely nothing like the Heinz version, they’re worlds apart in terms of flavour, but both have a place in my stomach. Dave loves the tinned mulligatawny soup and has it regularly. Just the smell makes my stomach churn! It smells dreadful. However, this one, made properly, did not smell dreadful at all. At first it smelt pretty much as the start of any curry cooking does. Onions frying and spices being added. When it came to serving it the scents were complex and mild rather than that choking smell of the tinned soup. It’s so juicy! It’s a really juicy soup. 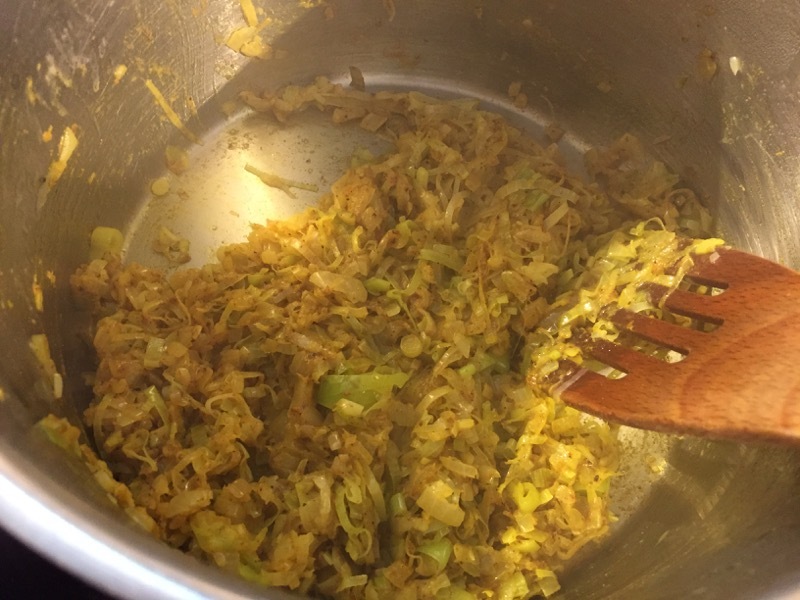 Yes I could taste the beautiful chicken stock that Dave had made out of last week’s roast chicken carcass, and it was nice to be able to taste such a subtle flavour in so complex a dish, but I love lime and so that juicy lime taste was something I loved from the first spoon. It’s pretty amazing how many flavours are distinguishable in this soup if you concentrate on it. I think, as a whole, we’ve forgotten to focus and concentrate on food and flavours. We eat fast, we eat whilst doing something else, we just shovel the food in (I’m talking in general here, not me per se!) and we’ve forgotten to savour it. We owe it to the food that was grown or born for this very moment, to actually be bothered to consider it and taste it properly. Wow, soup to wax lyrical about! 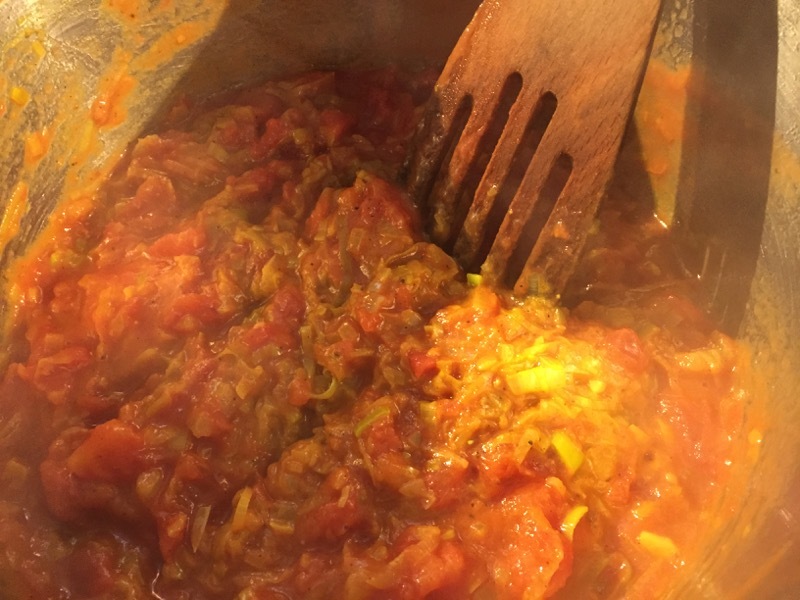 The flavour of the tomatoes was there, adding a sweetness to the lime. I could pick out the taste of the lentils and onions. There was a flavour that was eluding me though and I’m ashamed to find out that it was coconut. I can usually spot that because I like it so. Coconut milk to add to the creaminess of the dish. There were spices too; why do I always find the cardamom, usually after I’ve chewed it! And lots of coriander. All in all I’d say this was a beautifully complex soup. Very warming, for this dismal June day, and very colourful too. That could easily have been served in a top restaurant. PS now to clean the kitchen. Dave admitted at first to “dropping” half a lime into the soup and splashing a bit. But on further interrogation it seems the lime was too big for the squeezer he was using so he pushed harder, it slipped and he basically ended up propelling the lime into the pan from a decent height! The cook book bears scars, as do the walls, the front of the cooker, possibly the ceiling and certainly other areas not immediately obvious that will come to light over the days ahead!